Over the years many parents have reached out to me for emotional support after their child was diagnosed with autism. I particularly remember getting Jenny McCarthy's phone call shortly after her son's diagnosis. Like most moms and dads, she needed to connect with somebody who knew first hand the swift gut-kick of this difficult diagnosis, somebody who had been in the trenches for seven years already. We cried. We cussed. We even managed to laugh. We spoke for eight hours. She was naturally frustrated with the lack of answers about autism. I was there for her as I'd be for any parent, and I told her she was blessed to get such an early diagnosis. Her passion was palpable and I could tell she was going to grab autism by the horns, making it her mission and focus. I knew she'd help spread autism awareness like nobody else could and the media would pay attention. Since that phone call, she has created a very successful platform with her powerful opinions, blogs and books on vaccine safety, diet and recovering her son among other things. It has been a courageous, controversial, and fearless ride. Miss Jenny is not scared to get in the ring with the big boys! Though I share many of same concerns, I feel compelled to shed light on the fact that families affected by autism are struggling on multiple levels. We need a shift of focus to share the spotlight with other often overshadowed issues that profoundly impact families daily. Bottom line is treatment is completely and ridiculously unaffordable and can financially bring a family to its knees ... even in good times. Families live on pins and needles with hopes that they're doing the right thing. But the fact is for too many, the things we want to do are simply out of reach financially. I can think of no worse scenario than not being able to afford to help your child. Alas, accepting my son's progress or lack thereof is the key to moving forward with my head up. Our son is almost 13 and has entered puberty. Oftentimes kids on the spectrum can start puberty prematurely, and it can be an extremely jarring experience. A dear friend of mine and autism "Superdaddy" explains puberty's effect on autism like this: "[Puberty is] an 'oy vey' for a normal child but it can send hormones racing in a child with autism that they don't know how to deal with." The hormonal surge can cause violent and unpredictable behavior. Stress and depression can develop accompanied by social ostracism. Our son has suddenly regressed recently after making so much progress, bringing us a new set of challenges we hadn't anticipated. We always always remain extremely hopeful and have been blessed beyond our wildest dreams with what he has been able to overcome to this point. But puberty has been a challenge more parents need to be prepared for. It can be a completely different dynamic at this age. Let's get that out there, please. if a child is diagnosed with autism as early as 18 months of age, offering the toddler age-appropriate, effective therapy can lead to raised IQ levels and improved language skills and behavior. That's why the fact that African American, Asian, and Hispanic children tend to be diagnosed much later than other children (sometimes 2-5 years later) is extremely concerning and needs more attention. One reason these children are diagnosed later is that there are more barriers for socio-economically challenged families to access information. Certain developmental milestones are ignored, unknown, or overlooked. Another part of the reason is that there are some cultural and social stigmas about mental health and a fear of talking openly or seeking help for them. So the hope often is that the child will just grow out of it. We just need way more infiltration of autism information and support in minority communities, which will hopefully result in earlier diagnosis. I've visited black churches with this message letting them know they can be extremely helpful in this effort. We can't allow the window for "age-appropriate, effective therapy" to close on these kids. Autism is not a divorce mandate. Often it can bond a family tighter. But too often the financial and/or emotional toll autism can take leaves some couples feeling distanced from each other. This was the case with our marriage. My husband and I narrowly survived statistic status. But over the last ten years I have marveled at his ability to evolve as a father and husband during this bumpy ride that he chronicled in his new book Not My Boy! A Father, A Son, and One Family's Journey with Autism (Hyperion). I want to shamelessly plug my former NFL Quarterback's evolved, honest account of his pain of dealing with this diagnosis. His personal revelation was that he had to adjust his expectations of his son. Our hope is that Not My Boy! will help so many dads (and moms) confront these challenges without feeling so alone. Rodney has taught me that men process things so differently. I could have been more patient and empathetic with respect to that ... a book like this might have offered me that insight earlier on. Couples digging deep to find the strength and resources to take on this fight together may be rewarded by actually connecting more deeply through this journey instead of being fractured by it. We don't see too much coverage about what the siblings of autism endure. Ruined play dates, family outings cut short due to a brother's or sister's public meltdown, feelings of neglect, life planned exclusively around the affected child, social stigma ... the list goes on. It can be devastating for a typical child to have to grow up in such an environment. Sibs are often overlooked and really need a bit of attention; parents need tips to help the siblings cope. 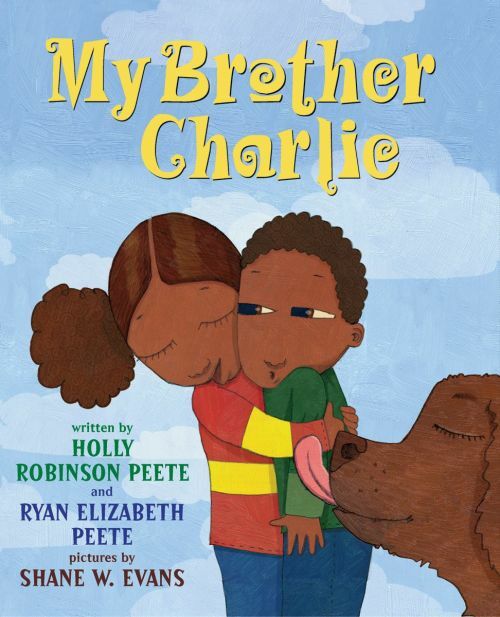 I'm so hopeful this will change a bit with the release of My Brother Charlie, a new children's book co-written by my daughter and me. (We've been a busy family!) Told from a sister's perspective, in My Brother Charlie, Callie acknowledges that while it hasn't always been easy for her to be Charlie's twin, she advocates lovingly for her brother, letting people know about all the cool things he can do well. I pray this book will go a long way towards fostering autism acceptance among children and mainstream schools. We found it hard to believe that there wasn't already such a book in children's libraries, considering the rising number of children on the spectrum. We are thrilled that Scholastic stepped up enthusiastically to embrace this important effort. The face of autism is changing. Our children grow up. Understandably, every parent stresses about what will become of their child with autism in adulthood. It's my own personal recurring nightmare. We ask ourselves: How will he make it in this cruel world without me? Will he live on his own? Will he ever get married or have meaningful relationships? Who will protect his heart? Our fears in this area can consume us. The good news is many adults living with this disorder live very fulfilling lives, but too many face a variety of difficulties including anxiety, depression, anger, and social isolation. We must create meaningful respectful futures for adults with autism that include homes, jobs, recreation, friends, and supportive communities. They are valuable citizens! How glorious would it be to get more media attention on this particular issue. And bravo to Fox Searchlight Pictures for their beautiful and enlightening film Adam, which gave great insight into what it is like for a young man with Asperger's syndrome to live and thrive on his own. What a concept! Rarely do you hear any stories in the media about people actually affected by autism ever weighing in on the issues surrounding it. Because people on the spectrum may seem disengaged, they hear you talking about them and can develop frustration at not being able to respond to issues that affect them. We all need to remember that. I have had some enlightening and profound conversations with folks on the spectrum who have made it very clear that they feel completely excluded from any national autism conversation. I've had some ask me to be very mindful about my language when speaking about autism. For example, several have said to me they cringe at the word "cure." Many have expressed that they feel this was their destiny, that they were born this way so stop trying to "cure me." Whatever our views or personal agendas, we have to respect that. Others have been frustrated by the polarizing issues disproportionately covered in the media and would prefer for us neurotypicals to focus that energy towards trying to understand their world, how they see things. "Come into my world!" one 25 year old young man with Asperger's told me passionately. My friend, 14-year-old Carly Fleischmann, has autism, and has taught me more about it through her expressive writings than I've learned in any book! You go, Carly! I am also so grateful to HBO for the sensational Temple Grandin, finally giving us an image in the media of an adult with autism advocating beautifully and articulately for others like herself. Bottom line: Their opinions should be heard, valued and included. So here's to breaking off eight rays of the media spotlight towards some other important autism issues. Families affected by autism deserve more than just fiery headlines; we deserve a 360 degree, multi-faceted conversation. Spread the word! This essay originally appeared on The Huffington Post.